In 1949, SIG SAUER created the P210 semi-automatic pistol for the Swiss Army. 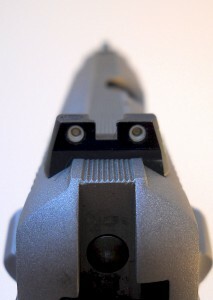 Apart from production innovations, the P210 earned an enviable reputation for excellent recoil control. In terms of precision and reliability, the gun was the Glock of its day. 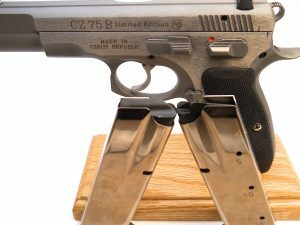 In 1975, Ceska Zbrojovka released the CZ75. If you were feeling charitable, you could say the CZ’s slide-in-frame design echoes the SIG’s. More importantly, the CZ75 repeated the legendary SIG’s winning formula: a relatively heavy, heavy-duty sidearm that helps shooters place rapidly-fired bullets with unerring accuracy. With the success of their semi, CZ created a family of firearms, including various calibers, trigger systems and frame materials. The CZ 75 B is one of the best of the breed . . . The CZ75 B Limited Edition is a matte stainless steel finished 9mm DA/SA (Double Action to Single Action) full-size pistol with exposed hammer and an upswept 1911 style beavertail. The look is all-business, with classic proportions enhanced by a gorgeous upwards arch in the lower part of the trigger guard. The CZ 75 B variant sports an extended frame that’s one inch longer than the original CZ 75. This added support supposedly enhances accuracy and extends durability. There are reports of shooters running 75,000 to 90,000 rounds through the B without major repair or major parts replacement. And even more reports of shooters in love with the CZ 75’s ergos. 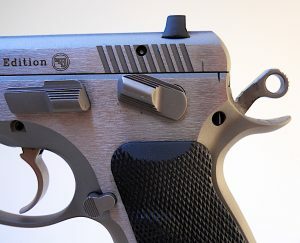 The CZ75 B uses traditional three dot sights. The Limited Edition’s Tritium night sights are standard, adding to the firearm’s appeal as a home defense weapon. The CZ 75 B’s slide release and safety aren’t over-sized, but they might as well be. They’re perfectly positioned and snick into place with reassuring precision. That said, shooters with small hands might find the slide release a bit of a reach. Worse, the safety can only be enabled when the hammer is to the rear. Which pretty much means you can carry the gun any way you like as long as it’s cocked and locked. Owners who carry a 1911 will be happy enough with the all steel CZ 75 B riding on their hip. Despite the fact that the gun has a 16-round double-stack magazine, it doesn’t feel particularly bulky. Heavy yes. (2.2. lbs.) Bulky no. Fans of John Moses Browning’s work will also be OK that this CZ variant lacks a de-cocker. To lower the hammer without firing, the manual suggests pulling the hammer and grasping the trigger with your weak hand to slowly and safely ride the hammer forward. Safety says otherwise. Takedown is almost as easy as dismantling a Lego tower. The photo above shows the two marks on the rear of the frame and slide. Align them, pop out the slide stop lever, release the slide and your done. Disassembling the gun gives you an appreciation for the 75 B’s heft and sturdiness. The half length plastic guide rod is the only part which isn’t built like a brick outhouse. You’ll find the same half-length guide rod in the CZ 75 B’s big brother the 45acp CZ 97 B. Or not; plenty of owners swap it out for a stainless steel part. To give the CZ a workout, I started by firing 16 rounds out of each magazine. True to form, the strings were both fun and fault-free. The CZ’s all-steel frame absorbed the 9mm recoil as if it were spitting out .380s. The 75 B has a somewhat long, heavy double action pull with a slight amount of take-up. It weighs-in at eight pounds on my RCBS trigger gauge. In single action, the pull is a cleaner, crisper four pounds. Shooters comfortable with two different trigger pulls will find no issues with the CZ 75 B’s go pedal, which is at least as smooth and predictable as anything you can buy from SIG. After initial functionality testing, I fired 124gr 9mm reloads, testing for print to establish where the rounds landed in reference to point of aim. The gun was spot on. 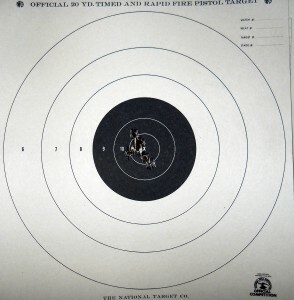 Running a target out to 7 yards I tested for combat accuracy firing five rounds standing two-hand unsupported hold. Impressed with the initial accuracy at seven yards, it was time for something a little more demanding. This time I loaded each chrome magazine with six rounds of 124gr 9mm and fired each rapidly with quick mag changes. 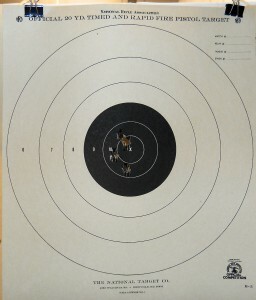 The next test was performed with the same 124gr 9mm reloads at 10 yards with 6 rounds. Anxious to see how the CZ 75 B would perform with heavier loads, I fed it a magazine with six factory Federal 147gr 9mm rounds, and ran the target out to 15 yards. As you can see, the groups opened up at greater distances with a heavier load. 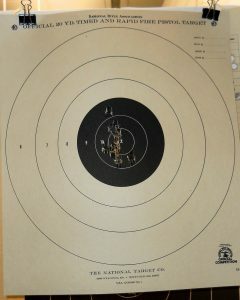 I’m not sure if this was me or the gun, though I knew right away I pulled the last bullet on the right of the target. 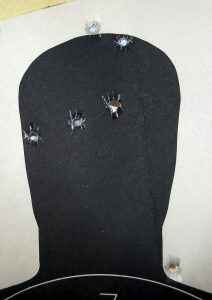 Though there was noticeably greater recoil with the Federal factory rounds, I loaded the other magazine with six rounds to take aim at the silhouette head at combat speed with the target at 15 yards. Again, this was not the group I was looking for. The last round was low and to the right which I knew as soon as I pulled the trigger. 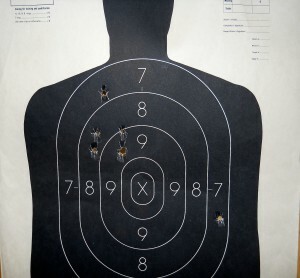 With more range time I could tighten these groups; I feel confident the pistol is more accurate than the shooter. Bottom line: the the CZ 75 B is one of the best 9mm service type semi-autos on the market today. Did I mention that CZ discontinued the more expensive Limited Edition version in 2010? Or that SIG has started making the P210 again? What does that tell you? Though originally designed in 1975, the CZ75B Limited Edition with its bead blasted and brushed stainless finish will make this firearm stand out in any gun shop case. Add a set of the wood CZ logo grips and this would be a perfect 5 stars. The CZ75B feels better than any semi auto I have ever held in my hand including classic 1911s. 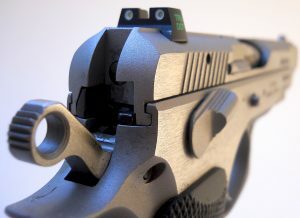 The slide release and safety are simple and easy to use, but shooters with small hands might find the slide release a stretch. My daughter, who’s a slender 5ft 10in tall with larger than average hands finds it difficult to reach the slide release using just one hand. The CZ75B performed perfectly with all brands of ammunition including my reloads. This included 115gr Blazer, 124gr custom reloads and 147gr Federal. Equipped with tritium night sights and two 16 round chrome magazines CZ left no stone unturned in making this a complete service pistol or home defense pistol right out of the box. Though a set of CZ Custom G10 grips or CZ logo wood grips would push its looks over the top. The CZ75B is very impressive and possibly the best 9mm service type semi-auto on the market today. A trigger job from the CZ custom shop would help smooth out that long double action pull but the single action break is a joy. A 75b is a great option for someone looking for a top quality alternative to a 1911 at a more affordable price. I have heard nothing but good things about this pistol. I carried and shot in contests a TZ-75 9mm for 28 years and never had any problems. I sold it for $50.00 more than I paid for it. I would not even guess how many rounds went through it, I told the buyer it needed a new Barrel but he said he was very comfortable the way it was. I moved up to a .45 cal. Staying with the same company, Tangifolio (after 28 years why change?) and bought a Witness Elite only for the extra punch, I have to admit I am very pleased with it, but I would buy a CZ or TZ any day and not look back. About the only thing I can add to your review is a suggestion to try a CZ 75 Shadow or P-01 Shadow. Those are the ‘factory customs’ from CZ Custom, I just purchased a C75 Shadow T this Friday and I regret having waited so long. Nice review. Good job very well done! Interesting, I’ve never heard of this edition! Btw, the image links are kind of messed up. I have three CZ75/85 pistols and they are by far my favorite in the gun safe. Accurate, reliable and what to me a real gun should feel like. None of mine are decocker equipped and I have no issue with lowering the hammer but I have practiced this many, many times on the range. Wait – is that a safety on the right side (for lefties)? If so, do they make this in a compact size? The safety IS ambi, the slide release is not. The mag release is not either but can be moved to the other side. My CZ-75 stainless drops the slide when you seat a loaded mag firmly. Kind of takes care of that. I have had the basic 75 b for well over a decade and have put countless thousands of rounds downrange. I find the gun is far more accurate than the shooter as well. I also own a few other CZ firearms and find they are all built to the same high standards. They also have a 75BD (decocker) available and a wonderful Kit called the Kadet that converts your 9mm to 22 in less than a minute for range time and trigger practice for pennies a round. It utilizes the frame and trigger group so you have the identical pull and break points just less recoil. Great review, as a CZ owner and fan I concur. Don’t forget the CZ75B SA model,true single action with ambi safeties in both 9mm and .40. I too have had a Cz-75 for over a decade. I have put at least 20000 rounds thru it. One, I repeat ONE failure to go bang in that time. It was ammo related. More accurate than I am capable of shooting. And it was dirt cheap. They aren’t dirt cheap anymore, but still more than worth it. A gun that will last your entire lifetime, and your childrens. And theirs. My PCR shoots best with 124 grain bullets. I have been saving for another pistol and figure to get a full size 75 or a Phantom. Saving the dough is taking forever and I am tempted to get a Kahr CW9 or CW45. The CZ 75 is a horrible pistol, and the sooner you all realize it, the sooner I can go back to buying them for under $400. Articles like this are only going to drive up the price even more. Dammit. Seriously, I’m glad to see the Czechs getting their due, and even though you’ll pay more today, they’re still a bargain considering how much you get. Whaaaaat??? Cz owners might smoke some stuff, but whatever your smoking PLEASE GIVE IT UP. The sooner you do this the more CZ’s you’ll collect and be happy! Have owen enjoy them for what they are soft good 9 mm handguns. The CZ 75 and it’s variants are simply great pistols. 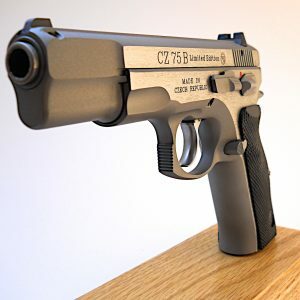 For those of us who like to tinker the CZ Custom Shop here in Arizona is a terrific source for upgrades to the trigger, DA to SA conversions, custom sights, and more grips than you can imagine. I shoot a 75B single action in .40 and often use the superb Kadet .22 conversion for inexpensive plinking. I also own a 97B large frame variant in .45 ACP. I like it so much I sold my Gold Cup and have not missed it at all. I have the CZ Ltd reviewed above and it has just about ruined other pistols for me. I have to force myself to shoot my Sig. I also have a CZ custom shop P01, the double action is better on the stock ltd. though the single action on the custom shop P01 is outstanding. The only problem I had after many 1000s through the 75 B is that crud built up behind the extractor causing a few FTEs. Now I clean behind the extractor every thousand rounds or so. I have nearly 2 dozen CZ’s from pre-war model 24’s to the most current models. Check out http://www.czfirearms.us and join in the chat! Is it possible to fall in love with a gun? I have no idea how many rounds I’ve ran through my nickel CZ 75b but it’s in excess of 10,000. Not one single failure. It’s steel, it’s heavy (but not too heavy), it feels exactly like a gun should feel in your hand. Despite being a service pistol, it’s more accurate than I’ll ever be. The best thing that I can say about it is that despite having over a dozen pistols in my collection (not a single piece of junk among the lot), if I was in a situation where my life depended on a single pistol, I’d grab my CZ 75b without a second thought. It goes bang every time you pull the trigger and every time it goes bang, it’s on target. At 14 yards, lousy shot me was shooting that CZ 75b as well as a .22. From the first shot it was clear that this thing is far better than a Glock is at “making bad shooters good”. Happiness is a well tuned CZ 75D Compact. It was love at first grasp. I bought a CZ 75-P07 a couple of years ago because I thought it looked really cool – better than the Glocks or Smith & Wesson M & P’s next to it. Initially, I had some problems with the pistol, but CZ shipped me a brand new one, which has functioned flawlessly. I like the way it feels in my hand and it points much better than any Glock. I’ve been wanting a CZ 75 B for quite some time now, I just plunked down $475 for one a couple of weeks ago. It’s the first all steel pistol I’ve ever owned and the most comfortable and best shooting pistol I have in my collection of Sig Sauers, Smith & Wessons, and (one) Glock. The CZ 75 B has got to be one of the best values in the industry. I’m looking forward to leaving it to a grandson some day. In my ongoing search for the “perfect” pistol, I added a CZ75B stainless to my collection because of all of the above excellent features (and after trying a range rental). Very nice gun. My only complaint is the trigger (and it may not be a complaint for long as I break it in): It’s a bit gritty, and I’ve found the sear doesn’t always grab consistently: Every once in awhile I get a surprise hair-light SA. (The well-used and abused range rental did the same thing, though the pull was melted-butter smooth, no grit). Otherwise, the SA breaks a lot like my 1911 (despite being a hinge trigger). Solid, natural pointer, feels great in my smallish hands, darn accurate. A good choice for the 1911 fan. Oh: Nice touches: mine came with snap caps and a mag loader. want to explain how this is a bad thing? There seems to be some good expertise here. I have been shooting for 60 years, and although I own a few semi-automatic pistols, my favorite carry gun is a Ruger LCR with CT laser grips. I carried a wheel gun for years both on and off duty as a police officer so I sort of lean that way. Having said that, I have fallen in love with the looks and feel of the CZ 75 and I want to purchase one. I am leaning towards the Phantom thinking that if I decide to carry it, the polymer model will be a bit more pleasant to carry for extended periods than a steel model. Any counsel from you CZ experts? As an aside, I find it amazing that I cannot even purchase one. Every single on-line dealer with whom I do business has no Phantoms in stock. I would think with demand that high, CZ would crank up production. Of course I can’t seem to buy a Shield either. Thanks for any input. You might want to consider the PCR. It’s the smaller CZ75, has a lighter, alloy frame and carries 14+1 in 9mm. There are more grip options for the PCR than the Phantom, as well. CZ cranking up production does not solve the supply problem when half of all police departments in Europe place orders for CZ guns. Just won a gunbroker auction for an all-steel CZ 75B. You guys have made me salivate now… dying to get my hands on it and run to the range! Since my comment in August, I purchased a CZ 75 Shadow T which makes me want to throw rocks at my vast collection of guns. This beauty is a joy to shoot and I think even some of the dilberts I see allegedly practicing at the range could actually hit the target with this gun. I think my next one will be a RAMI. I love CZs!! Just picked up a standard 75B in chrome and like a fat kid at McDonalds, I’m loving it. Feels perfect in your hand. Might have to check out one of these limited editions. The matte stainless and extra goodies look pretty damn good. As I understand, the CZ75B Limited Edition is no longer in production and therefore hard to find. 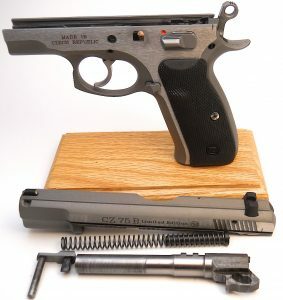 However, CZ has been producing a ‘New Edition’ which is similar to the Limited. The CZ75B New Edition has the same polished flats and bead blasting, but does not have the words ‘Limited Edition’ etched on the frame. It has night sights and comes with the CZ cocobolo wood grips. what is trigger pull weight in DA and SA CZ 75-b? can the Trigger pull weight be adjusted in DA? Cz 75 b omega……wow!! !…..what a pistol!!! I have a 1991 Cz75 in gloss blue and 2005 in gloss stainless. Both are unshot in my vault, together with a cz75 Kadet .22 conversion. Both my CZ 75 are beautiful, and have beautiful trigger pulls. just bought a 1993 Israli military cz75 in nice condition for $400 at a gun show. I love the trigger pull of all my CZ75’s, and plan to shoot the most recent CZ75 with the Kadet conversion. A friend has a CZ75 with the Kadet conversion and loves it. I look forward to shooting the Kadet conversion and purchasing another CZ75 compact in the near future. I also enjoy shooting my 1978 Colt 9mm commander. I have only shot about 500 rounds down the barrel, but have loved every one of them. I have shot, 147 gr. hollow point, 115gr. reloads, Steel and brass. This guns eats everything up. So glad I purchased this gun! I have CZ-75BD and CZ-83. I have put over 1,000 rounds the CZ-75DB with 2 failures to fully close to battery with Hornady Critical Duty after shooting 400 or 500 rounds of dirty ammo with a gun that was fairly dry to start with. After picking up the brass and calculating the power factor of Critical Duty it was obvious that the stock recoil spring was to strong for the low powered ammo. Recoil was not pushing the slide back far enough to fully feed the last 2 round in the magazine. I put in a 13 pound recoil spring and it has never failed in any way again. I was running the gun dirty and dry to see where it had problems. Even cleaned and lubed the Cortical Duty brass fell too close to me. To get a better double action trigger pull. I put a lighter hammer and firing pin safety spring and a longer firing pin from Cajun Gun Works to substantial improve the the double action trigger pull and get more reliable primer strikes. The kit comes with two hammer springs one for combat and on for competition. David warns not to use the competition spring on any ammo with hard primers. It worked for me on the hardest primers I could find. Tula and Wolf worked fine with the lightest spring. Before I changed out the firing pin a pencil setting in the barrel pointed up would come up about half way out of the barrel. With Davids firing pin and the competition hammer spring it goes 3 feet in the air. The same as all my older pistols. To be fair the stock firing pin was fine with the stock hammer spring. David at Cajun Gun Works also made me a Ghost ring rear sight, with a XS Big Dot for the front sight I can hold 6 or 8 inch at 25 yards with or without any pair of eye glasses I have for my 70 year old eyes. I lack about 2 feet being able to bring the sights in sharp focus with out glasses. For critical shots I use the Crimson Trace laser. Its just a lot slower that the Ghost ring and XS Big Dot. For accuracy the CZ-73 and pair of glasses with one lens that brings the sights in focus and one for the target shoots better than I could when I was kid shooting jack rabbits on the run all day long with young 20-15 eyes. I put different color lenses on the glasses as well. It keeps me from trying to switch eyes on the sights under 7 yards. I bought a CZ-72 to shoot up some 9X18 Makarov ammo I had left. I really liked the way it fit my hand and the accuracy was amazing. I was in a gun shop that the CZ-75bd & CZ-73 priced right and when I pick up the 75BD it fit my hand so well I reached for my check book. I have never seen a pistol, other than a revolver as reliable in my life. I have only been shooting 61 years. Once I got the sights to fit my old eyes and learned how old eyes work I shoot almost as well as I did 60 years ago, if the lights right. It feels like gun not a 2×4. Interesting post concerning old eyes. At 67 and wearing bifocals I find I can see the sights so much better without my glasses but the target suffers. Would like to know more about how you combat that problem. CZ 75B is well made and easy to shoot accurately. Very underrated pistol. Just got my first gun CZ 75 B about a month ago and I am loving it. I am a lefty and the only problem I am running into is finding a duty holster with level 2 retention for this beauty. I plan on being a CZ fan to the rest of my life. Thanks for all the reviews. It makes me feel like I made the right purchase quality weapon. Nice review. The article errors though. The gun is still being made. The gun is sold as the “New Edition” everywhere outside of the USA. Mine was made in 2012. CZ USA may not be bringing in any more of the guns but there is no reason why they cannot.